We’ve all been there: the dreaded writer’s block. Writer’s block comes on so many forms. We can’t seem to find the words that say what we want to say. We can’t come up with an idea. We’ve looked for every possible way to describe a murder without giving away who did it. We can’t find the right direction or the right angle. We can’t think of what should come next or where things should go. We’ve fallen out of love with our hero and don’t even want to be in the same room with him. The scenarios are endless, but one way or the other, they all lead us to the idea that we just can’t write. Over the years, we’ve written several posts on writer’s block, and one thing we’ve discovered is there is no better cure for writer’s block than writing. That’s right. You read that correctly. The way to cure writer’s block is to write. First, forget about what you’re working on or trying to write about. Second, write about something you feel and let it take you where it will go. People often say that feelings are the hardest thing to write about, but we’ve found that the opposite is true. For the most part, feelings are the easiest things to write about. They belong to you. They are obviously part of what is going on with your writing. And, most of all, no one can write about them better than you. And—now here is another key aspect of this—don’t try to make it a masterpiece. Just get it out. Let us give you some examples. You’re trying to write a novel that you just can’t seem to find the right ending for. No matter what you do, you can’t find the words. So… instead… write about what you’re feeling. Are you frustrated? Do you feel like a failure? Does it feel like Joe down the street always has the right words and you don’t have any? Does Aunt Martha always make fin of your stories? Isn’t she a crazy old lady? But isn’t Aunt Betty the best aunt on the planet? Doesn’t she always know just what to say? What would Aunt Betty say if she was in your story? What would happen to Aunt Martha if she was in the story? Who cares? Probably your neighbor Joe who is always writing. How is it that Joe is always writing? But have you ever seen Joe’s dog? Now that is a crazy dog! Does Joe’s dog have a name? As you can see, this can go on and on and on…. And, even though it isn’t an award-winning novel, a session or two of this therapeutic writing can get your pen moving when nothing else can. Some might claim it’s a bit of the therapist in me that thinks this is the best way to overcome writer’s block, but the truth is it’s the writer. There is simply nothing we write better about than the things we know the most about, and we happen to be who we know the most about. On top of that, this free-for-all stream-of-consciousness style of writing allows the mangled mind of a writer to simply spout out things without having to make them make sense. For a writer, this is a freeing experience, and it allows the creative juices that so often get bogged down in linear thinking to really break free and start flowing again. So, the next time you find yourself stuck, put away what you’re doing and let your emotions—and your mind—flow. You’ll be glad that you did. 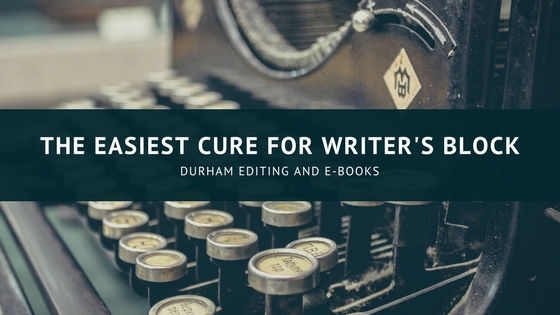 ← Why Should You Hire Durham Editing and E-books?